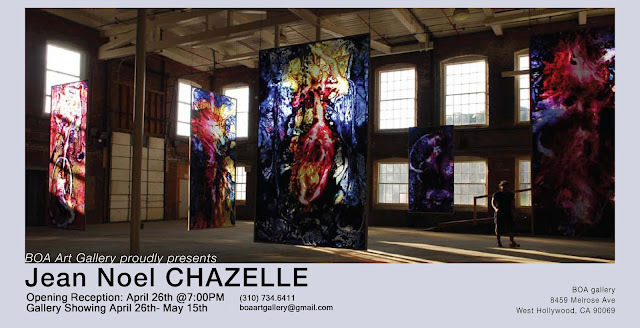 "Los Angeles is excited for their next visit from the Parisian artist Jean-Noel Chazelle, who will be exhibiting a collection of brilliantly colored abstract paintings on plexiglass at the BOA Art Gallery which are shining through (both literally and figuratively) and capturing the eye of several art critics across the United States and Europe. Chazelle began experimenting with this unique painting style in 1997 after a solid period of performance artwork in Spain. His ideas incite existential concepts of universal relationships in an avant-garde manner. The use of plexiglass as a canvas gives his works an added dimension, a new surface, and greater depth. His most recent work includes a feature in a 2012 Paris Fashion Week event presented by Etername Boudoir.